I discovered Melinda G because my friend Amy recommended them to me. Amy has had 4 kids and breastfed each one for 1.5 to 2 years – so when it came to nursing bras, she had a lot of experience! When she told me about how wonderful the Melinda G bras were, I immediately checked them out and added them to my store. I contacted Melinda and she was super nice to work with and she made adding a line of bras to my store so easy! I can’t tell you how happy I am that I found this line! My absolute favorite nursing bra of all time is the Melinda G Tee-Shirt Underwire Nursing Bra. This bra is fantastic for a number of reasons. 1) It is an underwire bra that accommodates a large bust. 2) It has a padded underwire, making it the most comfortable underwire bra I have ever worn. 3) It has 3 nursing clips, so you can adjust your cup size to fit your breasts – if they are fuller in the AM vs. the PM or at 3 months post-partum vs 8 months post-partum – this bra will continue to fit you. But don’t take my word for it, visit our Boutique Store and check out all of the great customer testimonials about this bra. There are lots of moms who love it as much as I do! This bra is so fantastic – my mother (who clearly is not nursing) is wearing this bra! In addition to a number of fantastic bras, Melinda G also makes a pretty fantastic nursing camisole! This cami is called the Cami Sutra and it is brand new! I have to be honest – originally I had no intention of stocking it in my store. So Melinda sent me one to try out and I am a true convert! I now have them on order for my store (they will be in stock in a few weeks!). 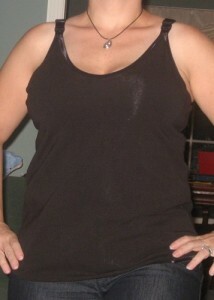 Let me tell you why I love this cami so much and what sets it apart from other nursing camis/tanks that are available. This cami has a FULL BRA inside. Not a shelf bra, but the same bra that is in Melinda G’s best selling Tee-Shirt Soft-Cup Nursing Bra – so you will get excellent support and won’t need to wear another bra underneath of it. This cami looks like a tank top, not an undershirt or bra – so you will feel comfortable wearing it as a shirt. This cami has an adjustable back closure to the bra inside of it – so you can adjust the fit of the bra to fit your body – independent of how the cami fits you as a top! This cami will fit you when you are pregnant and when you are nursing – so you can keep wearing it for breastfeeding after the baby arrives! And most important to me – this cami fits like a shirt – it isn’t too tight – so it looks great on everyone – you don’t have to be super thin or have a flat stomach to look great in this one! Just take a look at the photo of me in it. I never wear tanks or camis because they always accentuate my “rolls” at my mid-riff, but I love the way this one looks on me! And the support is AWESOME as well! As part of our Blogiversary Celebration, Melinda G has offered to give away one of her brand new Cami Sutra Nursing Camis to one lucky Mommy News & Views reader! To be entered into this contest please leave a comment on this post which tells us what your ideal nursing tank/cami would be and why you think this one is one that you would like – This is MANDATORY in order to be considered for a prize. But you don’t want just one chance to win do you? How about a few more! You can enter for extra chances to win this great nursing cami by doing any of the activities below. Just be sure to come back here and leave us a comment for each one – letting us know which ones you completed. 1) Blog about this post or our Blogiversary Celebration in general! Help us to tell other new moms about all of our great give-aways this month and into November! Be sure to come back here and leave a comment with a link to your blog post so that we can find it! 2) Spread the word! Tweet about this post and link back to it – be sure to include @MommyNews in your tweet and a link back to this page, and leave a comment here with a link to your tweet (you can do this once per day during the contest). 4) Don’t have a blog, not on facebook or twitter? No problem, we want you to have extra chances to win too – so go ahead and send an email to any of your pregnant or nursing friends. Be sure to cc: us on your email (blogiversary@blog.mothersboutique.com) and leave a comment here too! We promise not to add anyone to any mailing lists unless they specifically request to be added. 5) Purchase any item from Melinda G in our Boutique Store – and leave a comment here with the last 4-digits of your order number. You will get 4 extra chances to win for every purchase! That’s it! Lots of ways to win a Cami Sutra Nursing Tank from Melinda G!! This contest ends 11/7/09 at 5 PM. All entrants will be verified and must complete the mandatory entry before completing the ‘extra’ entries. Invalid entries will be disqualified. This contest is open to people with US-based delivery addresses ONLY. Winner must respond to email within 48 hours or we reserve the right to choose another winner. Disclaimer: We received a complementary Cami Sutra Nursing Tank to evaluate as part of this review. This gift enabled us to properly review this product and did not affect the objective nature of our review. I need a tank that is comfy (not too loose) but also supportive. I think this would be the perfect tank because it has a built in bra for support and also fits like a shirt. I need a tank that is comfy (not too tight) but also supportive. I think this would be the perfect tank because it has a built in bra for support and also fits like a shirt. My ideal nursing tank would have a lot of support, which is why I like the idea of the built-in actual, real, live bra. I also hate that hugging-tight look that just accentuates every ripple, so the skimming style of this one looks great. .-= Lauren @ Hobo Mama´s last blog ..Hobo Mama is looking for guest bloggers! =-.